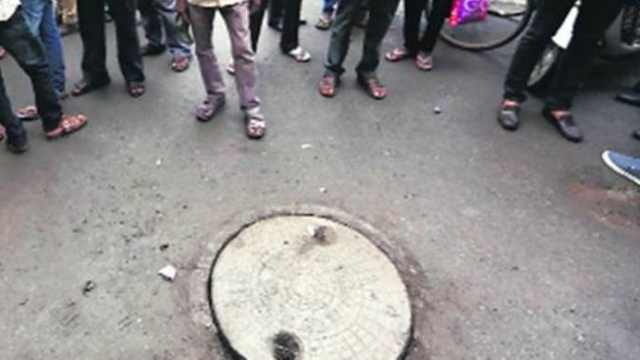 The Karnataka-based Safaikarmachari Kavulu Samithi (SKS), an organisation working towards complete eradication of the caste-based practice of manual scavenging, commenting on the death of 5 workers – Umesh (22), Raja (22), Pankaj (26), Sarfaraj (19) and Vishal (20) – on account of being made to clean a Sewage Treatment Plant (STP) at DLF Capital Greens, a residential complex in Moti Nagar, West Delhi on September 9, 2018, has said that these deaths “were not accidental and preventable”. As environmental regulations under the The Water (Prevention and Control of Pollution) Act, 1974 across the country have mandated treatment of wastewater by large housing complexes, Sewage Treatment Plants (STPs) have proliferated across large cities in the country. While making these regulations, no thought has been given to the question of who is going to clean them. Several of these STPs are ill-designed and do not include adequate measures for operation and maintenance. The STP at DLF Capital Greens in Moti Nagar, for example, was either not designed or not maintained properly, otherwise it would not have had untreated human waste producing poisonous gases which asphyxiated the 5 workers. It did not even have stairs for workers to enter and exit. Many of the agencies contracted to operate and maintain these STPs employ casual workers to clean the tanks in violation of Section 7 of The Prohibition of Employment as Manual Scavengers and their Rehabilitation Act 2013, as was the case at DLF Capital Greens in Moti Nagar. Often these workers are Dalits as were some of the workers who died on September 9 at DLF Capital Greens in Moti Nagar. Because of these reasons, STPs are emerging as the new killing fields of manual scavenging after sewer lines, manholes and septic tanks. In the last two years in Benglauru itself, at least 8 workers have been killed in 4 incidents while cleaning STPs. These deaths are NOT accidents and could have been prevented if appropriate regulatory framework for STPs had been put in place by Union and State governments. 1. The Prohibition of Employment as Manual Scavengers and their Rehabilitation Act 2013 needs to be amended to explicitly prohibit manual cleaning of Sewage Treatment Plants. c) The competence of these agencies should be vetted by the State Boards before empanelling them. As per media reports, it appears that the FIR in the case has been registered under IPC Sec 304 (punishment for culpable homicide not amounting to murder) and 304A (causing death by negligence); Section 3 (1)(j) of The SC/ST (Prevention of Atrocities) Act; and Sections 7,8 and 9 of the Prohibition of Employment as Manual Scavengers and their Rehabilitation Act 2013. Additionally, IPC Sections 336 (Act endangering life or personal safety of others) and 337 (Causing hurt by act endangering life or personal safety of others) are also clearly attracted and should be added to the FIR. Under Section 23 of the Prohibition of Employment as Manual Scavengers and their Rehabilitation Act 2013, “Where an offence under this Act has been committed by a company, every person who, at the time the offence was committed, was in charge of, and was responsible to,the company for the conduct of the business of the company, as well as the company, shall be deemed to be guilty of the offence and shall be liable to be proceeded against and punished accordingly”. Hence, not only the supervisor, but the proprietors of the private companies responsible for the maintenance of the STP should also be named as accused in the FIR. A compensation of Rs 10 Lakh should be provided to the dependents of all the 5 workers in accordance with the directions of the Supreme Court in Safai Karamchari Andolan & Ors. vs Union of India. Additionally, a compensation of Rs 4.5 Lakhs under SC/ST Atrocities Act 1989 as amended in 2016 should also be provided to the Dalit victims of this tragedy. We sincerely hope that Union and State governments will wake up from their slumber now and take all steps including the one suggested above to ensure that no one else will be killed in STPs.